We used to hate them, but something changed a few years ago and now we can’t get enough of dill pickles! 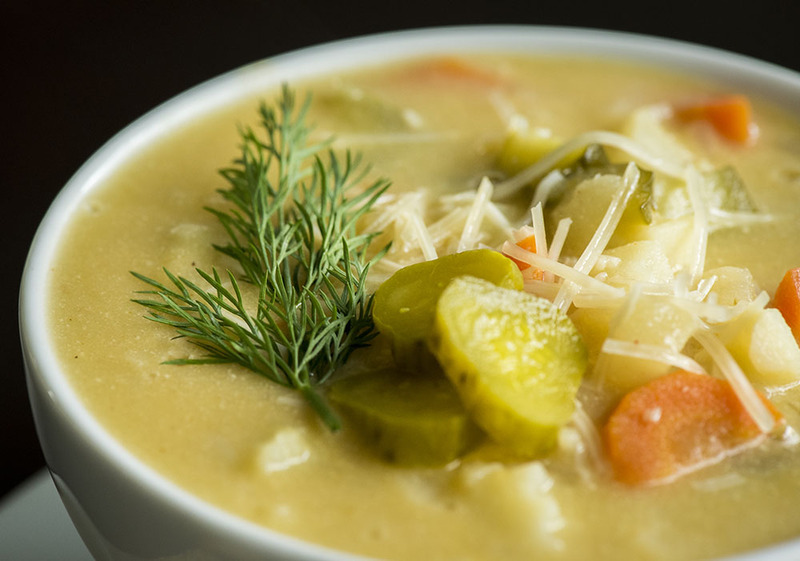 If you’ve taken a look at some of our other recipes, you’ll know we have a hearty appreciation for potatoes, so when we were thinking of ways to incorporate pickles into our dinner routine, it was only natural that we paired the two together in this fabulous soup! Typically we like to let soups simmer away for quite a while, but thanks to the tangy, intense flavor of the pickles and brine, this flavorful recipe comes together in about 20 minutes. The potatoes mellow out the tangy pickles and everything blends together to create something seriously yummy. Our family wasn’t totally convinced when we described what we were going for, but after that first bite they knew we were on to something! Even if you’re not a pickle person, this tasty soup will surprise you – try it out and see! Melt butter in a large stock pot over medium heat, then add hash browns, carrots, and onions. Cover and allow to soften, stirring occasionally, for about 5 minutes. Add flour and stir to evenly incorporate. Slowly pour in chicken broth and pickle brine, then add diced pickles, Old Bay, cayenne, and black pepper. Stirring constantly, bring soup to a boil, then reduce heat and cover. Simmer, stirring occasionally, until carrots are tender, about 10 minutes. Remove from heat and stir in one cup of sour cream. Ladle into bowls, top with additional sour cream, pickle slices, and fresh dill.